Whether it’s strolling the shops and restaurants on Abbot Kinney, or watching the bodybuilders pump iron at Muscle Beach - Venice Beach is never short on snap-worthy moments. 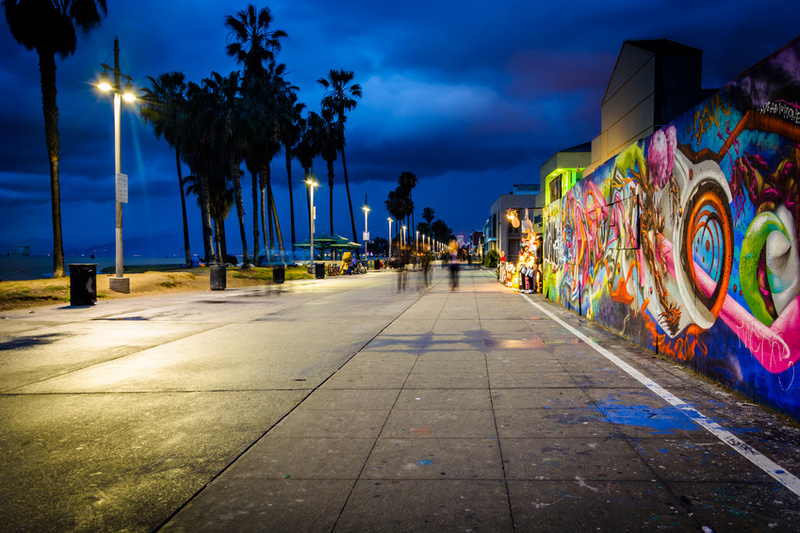 Located just south of Santa Monica, Venice Beach has become a hotspot for high-end boutiques, health-conscious cafes, and inspiring publc artwork. With its narrow streets and limited parking, Ubering there makes a day spent by the beach stress-free. Short visit? Make the most of your time in Venice with a curated experience. Check out a these recommended sights and delights. Get to know Venice without breaking the bank. There's no shortage of things to do. Check out which activities come with little to no cost. Biking along the beach is one of the most relaxing ways to spend your day in Venice. Not only will you see the best people Venice has to offer, but if you time it correctly, it's the perfect place to catch the sunset and a cocktail. The beach is shared by surfers, swimmers and boogie boarders alike. Don't forget to bring SPF and enjoy the water - it's not that cold. Snag yourself a “Lambwich” from Venice Beach Wines courtesy of UberEATS and stroll along the Venice Canals. Originally part of developer Abbot Kinney’s “Venice of America”, the remaining canals are a true hidden treasure. Abbot Kinney Blvd Get busy shopping and browsing, but don't ever go hungry. There are some great restaurants in Venice, and most of them can come to you on UberEATS. Catch the sunset from the boardwalk Walking around the boardwalk can get tiring, especially if it's hot. Take a break and bring your own blanket for a picnic.